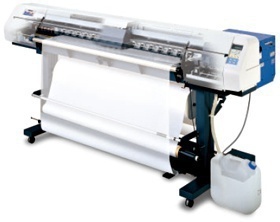 Tx2-1600 is the industry standard digital textile printer with high quality 720 dpi output. The TX2-1600 can mount ink variations for a total of 8 colors including 4 basic colors (CMYK) and 4 special colors. Ink that suits your application can be selected from reactive and acid dye ink variations.